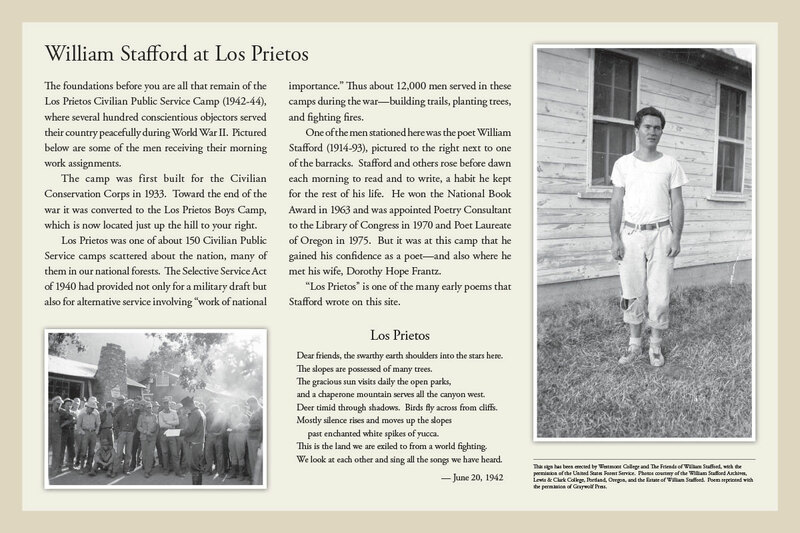 SSince 2007, Paul J. Willis has hosted the Los Prietos Stafford Readings, an annual community reading of the poems of William Stafford at the First Crossing Day Use Area on Paradise Road in Los Padres National Forest. This is the former site of the Los Prietos Civilian Public Service Camp, where Stafford served as a conscientious objector during World War II. The reading takes place in an outdoor picnic area at 2:00 pm on the last Saturday of January. There are usually one or two featured readers, but anyone in attendance is also welcome to read a Stafford poem aloud. Click image to view an enlarged version. Finally, a flower after my own. at the feet of ancient cedars. So few of them left, you know. ventricles on your green sleeve? Sun says, sun says, sun says it all. for just an hour. But what a shine. bay, sycamore, we sigh and pine. ushers to a new redemption. Each spring, a second chance. And a third. And a fourth. bent, turns my head in smooth surprise. blooming like a dusky rose. shade and sun please equally. on remnant snow in the ravines. wait for us around the bend? a new door, an old welcome? the dull business of low rent. to rooms we used to occupy. dismayed to be merely former selves. of any sort of timely departure. at timberline, wait for release. the ice clods from supple branches. make your bows to the world. scattered chapels of white fir. and no one thinking of the snow. cobalt comet in the sky? why don’t you come down to earth? from earth, what they give back. trunks lifted up to the moon. white oak, leaves with lobes. but no one opens a tree. 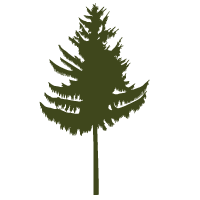 of cones on sugar pine, depending. arrayed on earth as they are in heaven. some sixty feet above the ground. a cord not easily broken. not our own, but other lands. eternal, of a lesser rank. were supposed to be coyote paws. of who would provide that part of us. our hands are lizard hands. down into cracks in the rock. to get his paws on him. Dry Creek, that you are not. to the gray, impassive lake. and he treads the log without a pause. His pack appears to be no burden. looks just like sponge cake. sponge cake with the frosting of death. split ends in your refried beans. Freshman Comp & Foot Massage. the jury box, the wedding chapel. napping in pools along the way. they have many years to leave. of soft vine maple raised in air. down to the river, down to the sea. the Puritan heritage of our college. from the dampness of the ground. that night before your first recital. “I’d rather break my arm,” you said. you found, is a dangerous thing. to bring joy to the world. the silver fin of a petal. Corvus on a black Corvette. was a car named Crow. Juncos spread across the lawn. after a night of dry winds? or the hot glaze of a cinnamon roll? that generous gift, your laughter? Is it rinsing the plates and pans in the sink? that will not be taken away? in the top of a lodgepole on the ridge. Like dandelion seeds, you said. along the furrows of our steps.